My goal for this 10 kilometer race was to break 40 minutes. It was exactly one week before the marathon so I didn't want to run it too hard and possibly get hurt. My best time for the 10k until that point was the Corporate Cup 2008 where I ran 41:05. Last year I chickened out at the last minute and didn't wear my FiveFingers. I had been training in my Classics for a few weeks but decided I wasn't ready to race in them (although I ran the marathon in them a week later...). So I really just wanted to break 40 minutes for the first time. It was a nice, cool morning and I showed up early and went into the seeded runners area. Actually, before that I stopped by the bathroom and got one of the usual comments about the footwear- "Do you actually run in those? ", to which I replied "Yes- all the time!". The seeded area is nice because there are around 10,000 people there and it allows you to get a little ahead of all the slower runners so you aren't bobbing and weaving around all of them. 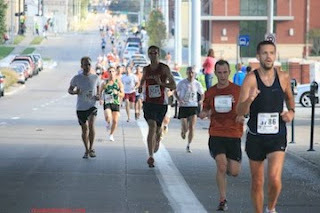 I didn't wear a watch for this race- I remembered that they had a couple clocks along the course the I could rely on. I ran at a pace that was really comfortable and I thought would be just right. I passed the halfway point right around 19 minutes so I decided that the pace was perfect. I think I could have run faster, because when I crossed the finish line at 39:21 I felt great (unlike last year when I felt like I was going to pass out). This must be evidence that more miles = better running economy!